From the list of new bridal hairstyles I want to mention wavy up-do that is still trendy and I guess that it will never go out of the fashion. Wavy up-do can be created even on chin length haircut. In this case the style of waves can be retro Marcel waves. Vintage style is amazing option for formal occasions. 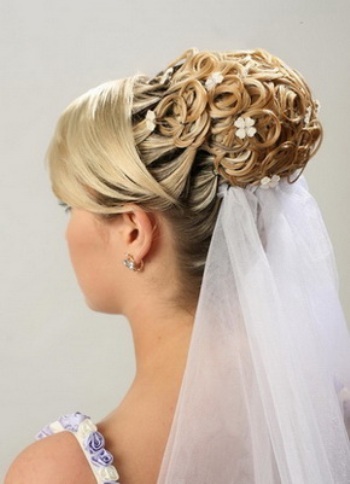 The owners of super long hair can wear half up-do hairstyle that look fantastic with veil and wedding dress. Long loose waves cascading down on your shoulders, what else can look more feminine and cute? Hair accessory is key detail in bride’s hairstyle. After you have chosen wedding dress and up-do, find accessory that will complete your ethereal image. It can be luxurious tiara, tiny flowers, brooch or any other shiny hair clip.